← It’s the end of January already! 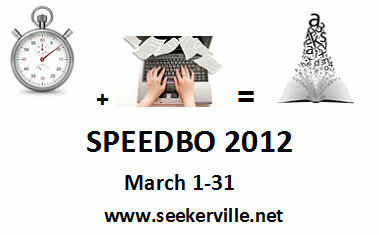 Come join the fun in Seekerville as we host our first annual Seekerville Speed Book, affectionately known as Speedbo. Much along the conceptual vein of NaNoWriMo (National Novel Writing Month), Speedbo will offer encouragement and praise (and of course, prizes!!) as we slug through rough drafts. The goal is to write as many words as possible. They may not make sense. Questions? Let me know and I’ll do my best to answer them. This entry was posted in Seekerville, Speedbo. Bookmark the permalink. 4 Responses to Are you ready?? 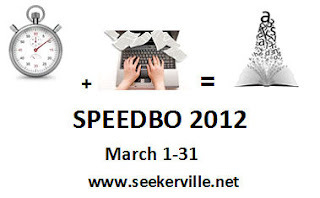 I just posted on Seekerville that I am going to do Speedbo. Crazy, huh? I think so. But I soooo need some accountability and some motivation. I love it! It’s going to be a blast…as only a Seekerville party can be : ) Oh wait, this is going to be a month of intense work. What’s wrong with making work, fun?? We’re goint to get LOTS of words on the screen, Sherrinda! I get the February 29 post to make sure everyone has all the necessary tools to make March a successful Speedbo!! Audra, I just might do that. I’ve just finished one book and am developing a new one in outline form.